strongly believe that the taste of your cake is as important as the look. 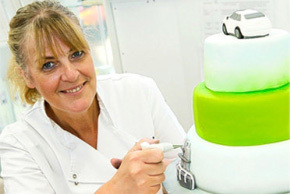 Sugar 'n' Spice has over 100 years of combined experience of baking and decorating cakes and can therefore ensure a quality finish to your celebration cake. We bake all our celebration cakes from fresh, good quality ingredients as we strongly believe that the taste of your cake is as important as the look. We hand craft all our decorations from sugar, including flowers, models and especially the brides and grooms on our wedding cakes. If you would like to subscribe to our regular newsletter just drop us an email and let us know. This will give you exclusive access to offers on many of our training courses and our new online store which is now open.